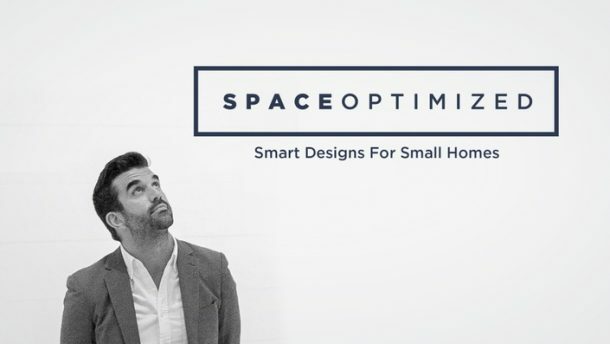 Looking for easy apartment hacks to organize your living space? We hate messy homes as much as you do! But if you lack the proper storage for your stuff, take matters into your own hands! 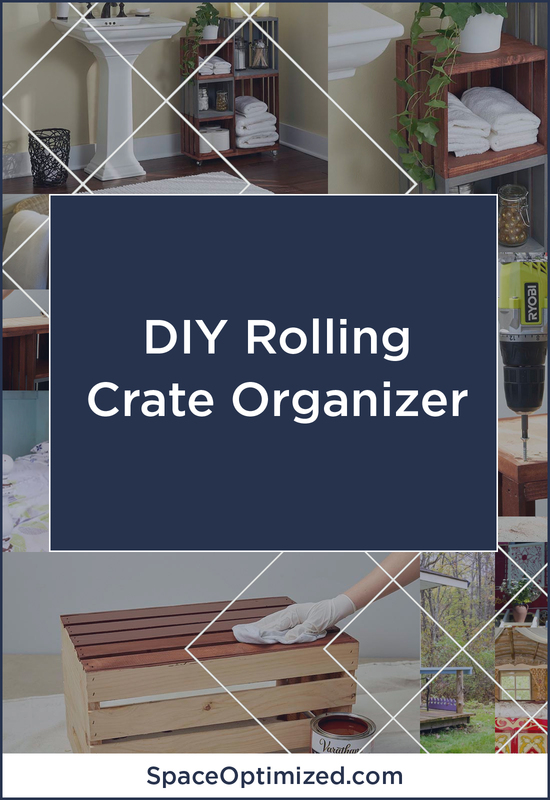 Make your own rolling crate organizer. 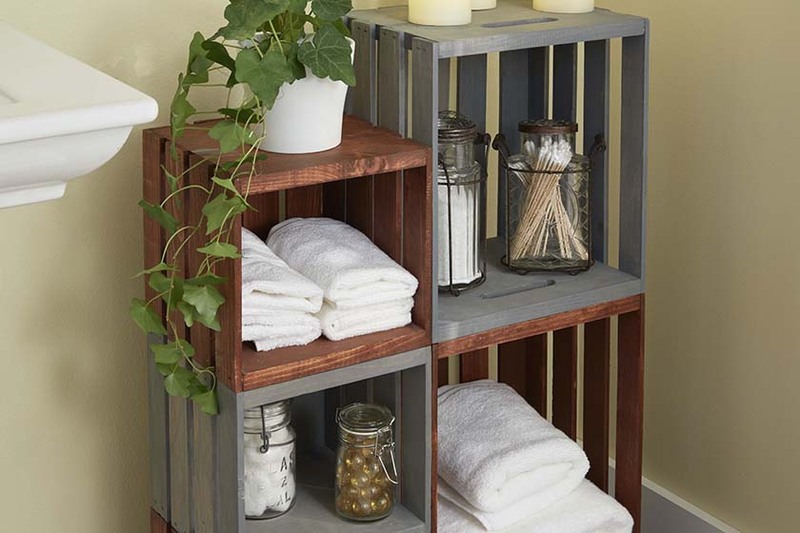 I found a cool tutorial on homedepot.com and it’s a fantastic way of re-purposing wooden crates. 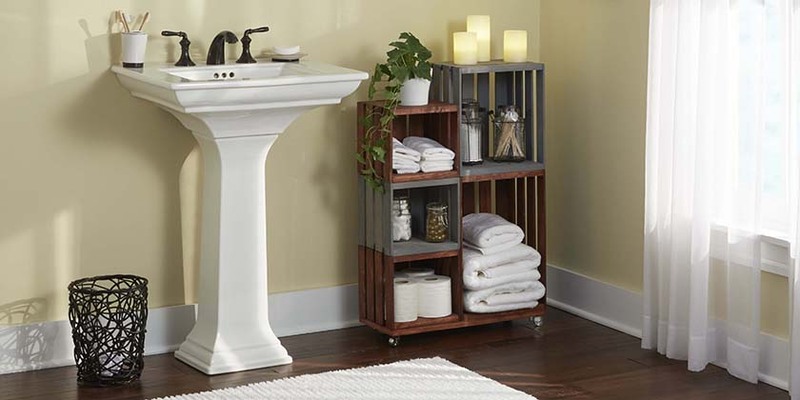 The beauty of this rolling crate organizer is its simplicity and versatility. You can use it to tidy up the bathroom, the living room or the children’s bedroom. 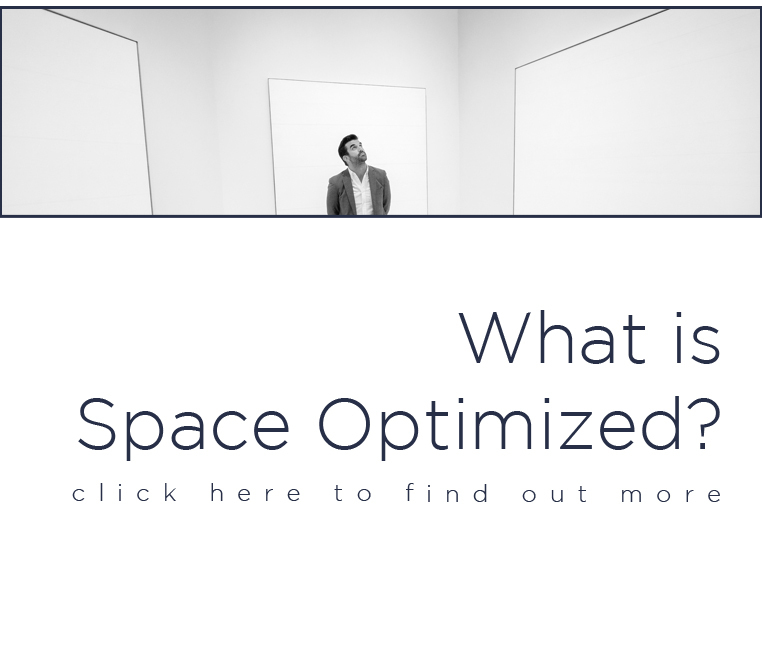 This example is a muted color, but you can always give your space a pop of color by painting it a bright hue. Also, putting it together is less stressful than say, piecing together a utility cart from Ikea. Best of all, assembly takes only a few hours to complete. Important: I’d recommend setting your workstation outdoors. Choose a well-ventilated area to air dry the wood stain properly and avoid stains. Wearing protective gear is always a must, too! You have to sand the crates so the wood stain penetrates evenly. So, with your #120 grit sandpaper, start sanding the crates one by one. As you progress, use the #150 and #180 grits to get a smoother finish. When sanding the crates, sand in the direction of the wood grain, not against it. 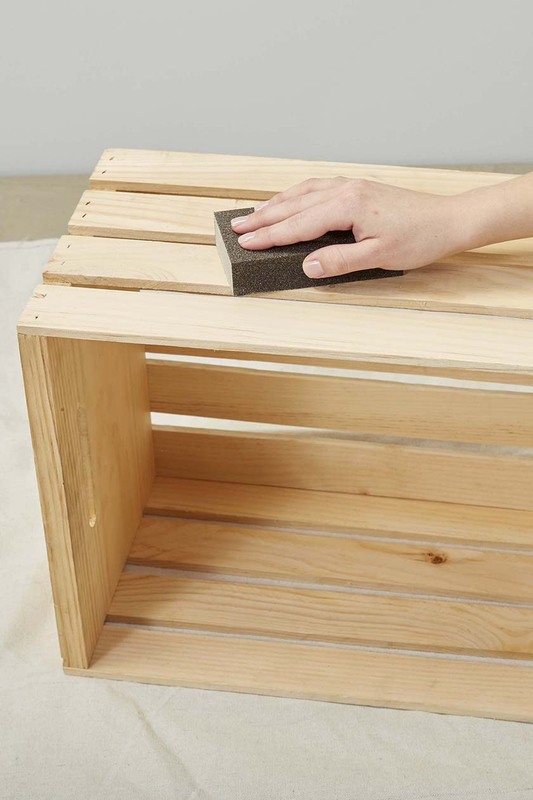 Finally, wipe the sanded crates using a tack cloth to get rid of sanding dust. After sanding the crates, it’s time to apply the wood stain. Using a stick, mix the can of wood stain well to get rid of the settled pigments. 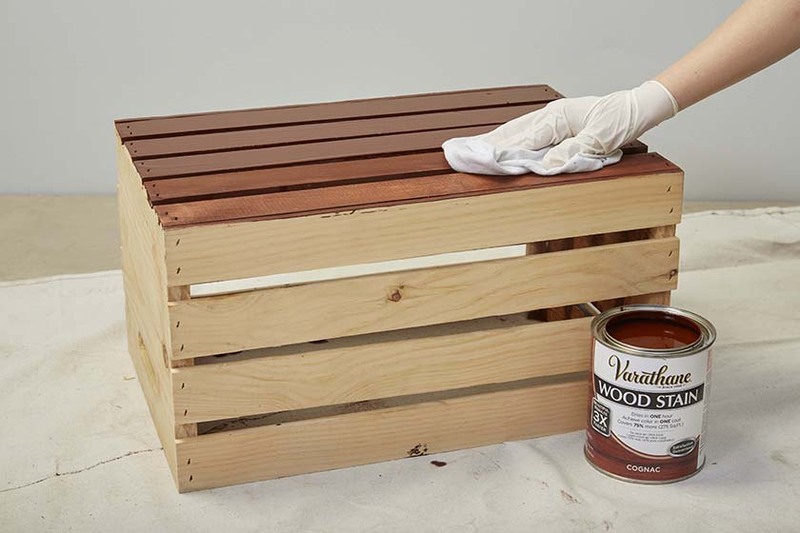 Dip your paintbrush or lint-free rag into the can of wood stain and apply evenly on the crate. Work in sections to get a uniform stain. After painting one side of the crate, leave the wood to soak in the stain for a few minutes. Remember, the longer you leave the stain to soak, the deeper the stain will be! What you want to avoid is leaving the stain to dry completely unless you’re done with the staining. 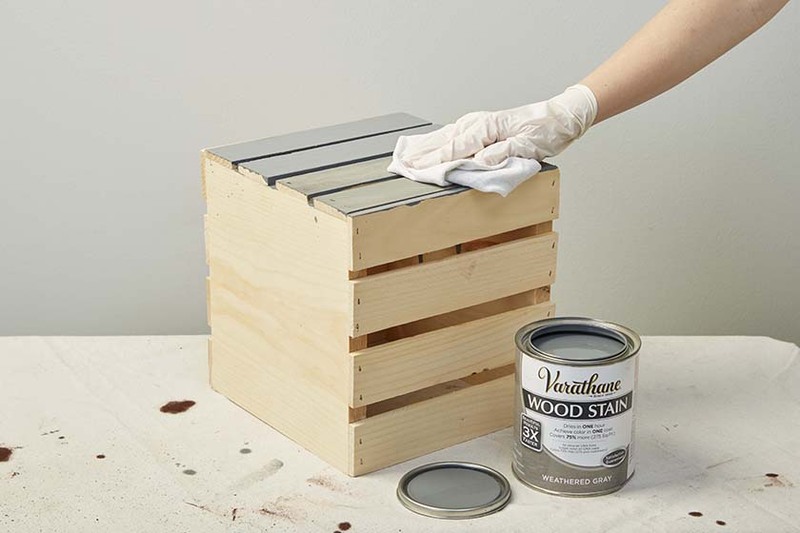 Now, you can paint all the crates a single stain – cognac – or you can paint a couple a weathered gray stain. Once you’re done staining the crates, wipe away the excess product using a clean cloth in the direction of the grain. Leave the crates to dry for at least one hour before finishing with three coats of varnish. Once the crates are completely dry, you can start assembling them into any setup that suits your storage needs. In this case, two large crates were stacked together on one side and three smaller ones to the other side. The easiest way to assemble the crates is by stacking them upside down, vertically. 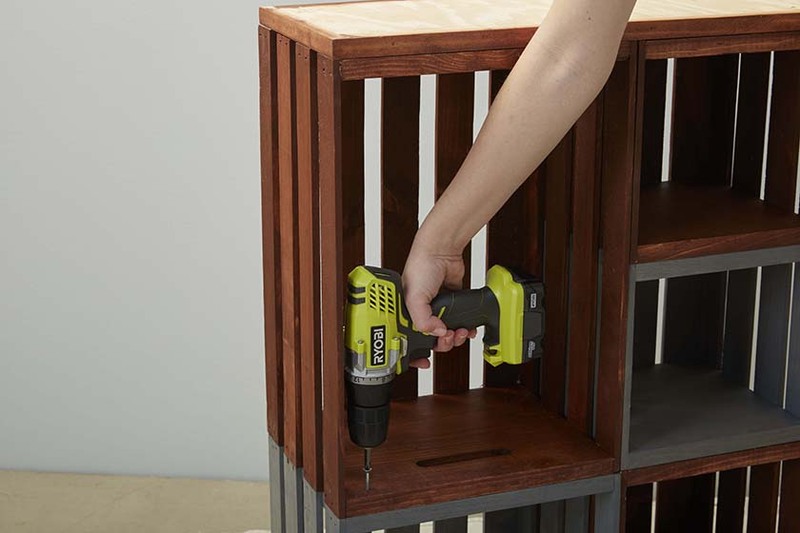 Then, drill pilot holes into the bottom of the crate. Lock the crates in place with screws. Place the crates on the base, which is the piece of plywood that’s been cut to size by your friendly hardware handyman. Drill a pilot hole for the screws on each corner. Attach the screws and you’re done. 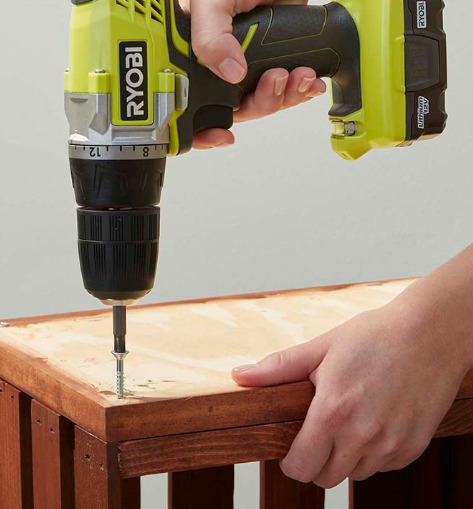 With your trusty drill, drill another pilot hole in each corner of the base. Then, insert the casters by twisting each one by hand then tighten the screws using an adjustable wrench. Flip the organizer on an upright position and your DIY crate organizer is done!